Hand refractometers are commonly used for determining concentrations of solutions from juices to battery acid. They are compact, easy to use and require only drops of sample. Early models, such as the one featured here were temperature sensitive, so include a thermometer and correction tables. More recent examples have an automatic compensation system built in, increasing their convenience. The catalog scan is courtesy of Van Waters & Rogers: Braun-Knecht-Heiman-Co. (Division of Van Waters & Rogers, Inc.) Catalog No 63, Laboratory Instruments Apparatus and Supplies. San Francisco. (1961). The instrument is of heavy brass construction with exposed metal finished in brushed or polished chrome as seen in the photograph. 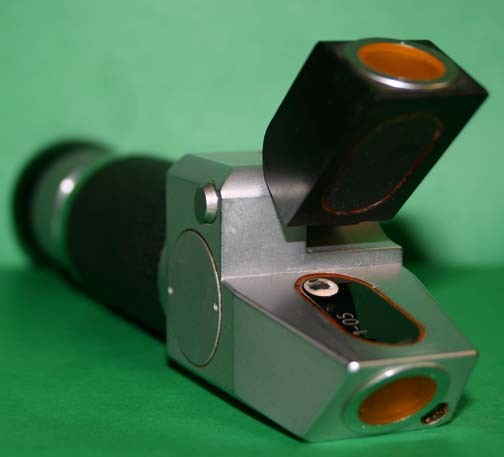 The center of the instrument is wrapped in beaded leather or leatherette to create a handle, while the upper prism cover is finished in a dull black oxide coating, as seen in the photograph of the prism assembly, and there is a black bakelite eyecup. The refractometer is 17cm long with the eyepiece set at '0'. The built-in thermometer, seen in the bottom view photograph, is graduated from -6 to 40°C in 2° increments, numbered every ten degrees. A pdf copy of the Zeiss leaflet for this instrument was kindly provided by Carl Zeiss AG (2009). The instrument was discarded (November 2009) by the Department of Surgery, University of Mississippi Medical Center, Jackson, MS.
1 "[From the photographs] your refractometer looks like a Hand Sugar Refractometer produced by Carl Zeiss in Oberkochen as it was produced in the 1950s." personal communication, Dr. Wolfgang Wimmer, Leiter Carl Zeiss Archive (November 2009). 2 Abbe, E. Neue Apparate zur Bestimmung des Brechungs - und Zerstreuungsvermögens fester und flüssiger Körper. Mauke's Verlag, Jena (1874) Taffel: Fig. 8.